In modern cities, more and more skyscrapers are built for commercial and residential uses. Air conditioning system for those building is quite common. However as the total height of the super high-rise building exceed 100m, the water and static electricity pressure subjected to pipelines of the air conditioning system is also below the conventional building. In particular, the lower part of the building's water electrostatic pressure will be greater than the maximum pressure capacity of copper tube bundles in the air treatment equipments and tube bundles in the hot and cold water host even. Now there are two usual solutions: 1) establish two independent high and low air conditioning water systems: set up areas of frozen - thermal room in the bottom (or basement), set high area frozen - Heat room in the middle layer (or roof). 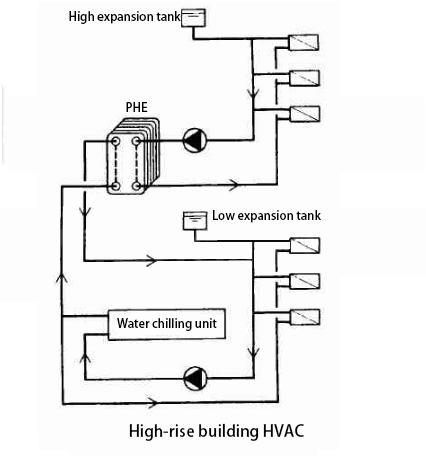 In this case, the high and low air conditioning systems and the pipe bundles of air conditioning unit are up to only about half of the water static pressure of the building height; 2) set up frozen - heat room only in the bottom (or basement), the cold (hot) water (primary water) is supplied to the district air conditioning system at the same time to the plate heat exchanger in the middle layer. In the plate heat exchanger where another air conditioner (secondary water) system separated completely from the primary water system is connected with high layer air conditioners. 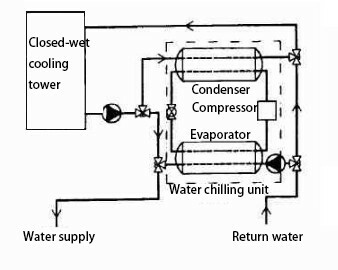 In this case, the high and low air conditioning water system is actually divided into two relatively independent units. The two systems are linked through the plate heat exchanger. Its most advantage is that high and low two areas share a centralized heating room and equipment. Thus although by adding a plate heat exchanger, the occupancy area is much smaller, it can save another warm room and can use empty room in the low layer. This solution is economic, easy for maintenance and convenient for management. In the air conditioning project (especially large central air conditioning project), the use of closed cooling water system has great benefits. Open cooling water system is simple and practical, low cost, but there are some problems such as poor water quality, cooling water seriously polluted, microbial reproduction and other issues. These further result in corrosion and scaling within the system, affect use efficiency and shorten the unit and pipeline life cycle. The use of closed cooling water system not only can overcome the above shortcomings, but also do 'economic cycle' in the excessive season or winter. It can use natural energy effectively, making the cooling water directly to the air conditioning water pipeline system. But this system is also still with high cost in a closed cooling tower: because of the very heavy tube it needs a strong foundation or stent especially in the roof will bring some difficulties in the structural design, the cost of equipment base increases. In the winter tube bundles will be frozen. At present, some manufacturers produce sealed evaporative cooling towers, which have a compact structure, small size, low noise, flexible adjustment and other characteristics, but still the price is quite high. 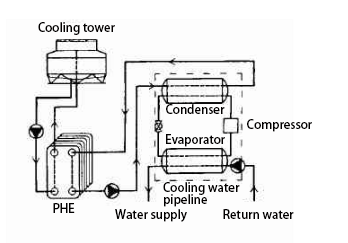 Another more economical approach is to use an open cooling tower connected to a plate heat exchanger, and a closed cooling water system is between the plate heat exchanger and the condenser of the freezer. As a result of the use of plate heat exchanger, you can get a very small heat transfer temperature difference. If use low-quality cooling water such as river water or seawater, it is quite appropriate to use a plate heat exchanger. Most of the plates are made of alloy steel or soft metal, which has only increased the cost compared with stainless steel. This type of cooling water system has been widely used abroad.